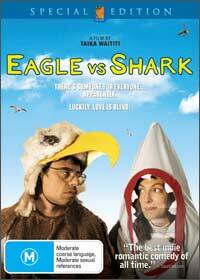 Eagle vs Shark is the delightful and quirky romantic New Zealand Comedy starring Jemaine Clement (Jarrod) and Loren Horsley (Lily), two socially awkward misfits. Lily lives with her brother and works at a local burger store, however when she finds out she has been sacked, her dreams of meeting Jarrod, a customer who has been visiting the store almost methodically at 12:00pm everyday for lunch is about to expire. Although Jarrod has a soft spot for another work at the burger store, he gives Lily an invitation to his "Fight-man" party where you must come as your favourite animal. The invite gets thrown into the thrash can and Lily decides to go on her behalf where the two become "almost" romantically involved. Director Taika Cohen does a brilliant job at creating this unusual tension and almost childlike innocent between the two characters as the viewer is given an insight into their strange worlds. A heart warming romantic comedy with two of society's misfits makes Eagle vs Shark a refreshing break from the usual Hollywood trash. Featured in widescreen with Dolby Digital 5.1, the quality is a little low, however it will not take away the charm of this quirky movie. Match that with some entertaining special features and Eagle vs. Shark is truly the feel good movie of 2008.